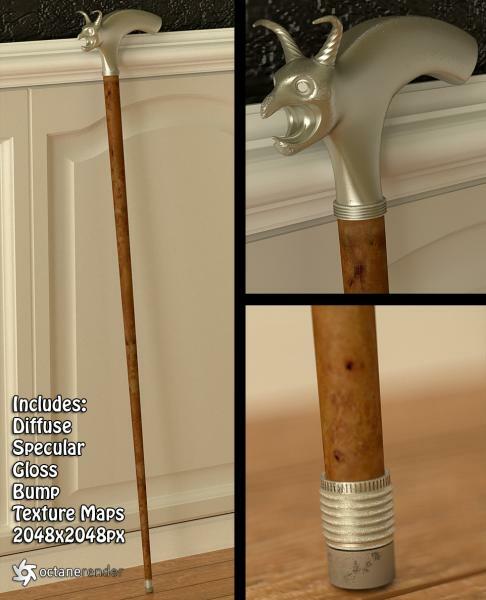 An ornate walking cane, with hardwood shaft, and solid metal "gargoyle" handle, metal junctions, and rubber tip. This model is built entirely of quad polygons and subdivisonal modeling techniques, and consists of 14,878 total polygons, and 15,112 vertices. The model has been UV unwrapped, and comes complete with diffuse, specular, gloss, and bump maps for each subobject material zone; however, you can use your own seamless procedural materials instead, if you desire. There are 6 subobject elements to this model; each of which can be assigned it's own unique material. I recommend using the maps provided as a basis for a reflective brass material, with worn edges, as seen in the example renders of this object. All of the preview renders were done with exactly the same texture maps provided with the model, using the Octane render engine, and Octane's glossy materials. The specular maps are intended for use in a reflection channel, and the glossy maps can be used in an appropriate channel to blur the reflections. Each texture map was created to 2048x2048, which should be suitable for most close-up rendering. The model is available as a native .max scene file, compatible with 3dsmax 2012 or higher. It is also available in several scale-specific OBJ files, for use in other applications, like Blender, Poser, or Daz Studio. You are free to use or modify this model as you see fit for your own projects or scenes. As with all my freebies, this model can be used for both commercial and non-commercial renders. You may NOT, however, resell or redistribute these models or textures. Thank you! As beautifully crafted as the real thing! hans2540 (5 years ago) Inappropriate? This looks great, I was just thinking recently that we need some new models and this one is just what I have been looking for.